I’ve mentioned Neal’s Yard a few times before, I’m a big fan of their distinctively packaged, gloriously scented and usually highly natural products. When the chance came up to take a look at their new Beauty Elixir, which is part of their Wild Rose range – I already own the balm, and the facial oil in this range too! – I jumped at it. 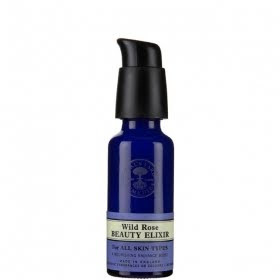 Luxurious new Wild Rose Beauty Elixir is enriched with wild rosehip oil, one of nature’s richest sources of antioxidant vitamin C, proven to help repair, firm and smooth the skin, ultra-moisturising hyaluronic acid, brightening turmeric, an anti-ageing peptide and the pure essential oils of frankincense and geranium. Use morning and evening after cleansing for radiantly glowing skin. “I’m not really one for make-up routines. My skin’s lucky enough to have the makeup washed off it at the end of the day. So when Lippie asked me to test this Neal’s Yard Beauty Elixir, I went a bit blank. Me: “That’s the greasy stuff in the jar that you made me buy, isn’t it?” <– well, I would have said that, except Lippie had THAT look on her face, so I nodded wisely instead. I do know what’s good for me, and arguing with Lippie isn’t. I’m 43, with unevenly pigmented, ageing combination skin. It used be a zit factory; now it’s just slightly dry. Eventually I found some instructions in a corner of the label, which said, “Apply with fingertips in a circular massage motion”. There was no indication as to how much, so I experimented with two drops.The serum was cool and velvety on my skin, and absorbed after a few rubs. On the hand it felt quite rich, and smelled faintly of roses. My face looked considerably pinker after application, but calmed down after a few minutes. On went the usual winter face, and off I went to work. Looking in the mirror after two weeks of daily treatment, I’d say that my skin is still unevenly pigmented, but ever-so-slightly pinker, clearer and smoother to touch. Clear smoothness: good. Extra pinkness: not so good. The pre-menstrual breakouts were fairly minimal too, though whether this was down to the serum or actually following a proper moisturising regime, I couldn’t say. Okay, whilst this possibly isn’t the most glowing review ever (and, I remember the conversation somewhat differently, iirc the wine reference came a LOT earlier! ), but, I will say this, I had dinner with Sarah last night, and she was glowing. I could see the difference in her skin, even if she couldn’t! If I could guarantee my skin would look as good after a couple of weeks use, I’d have snatched the bottle back there and then! Thanks for saying so, but remember my genetic intolerance of wine always leads to a rosy glow of varying degrees (from Organic Shiraz puce to Chardonnay purple). And Turmeric! That would explain the nuclear glow too. Actually, I noticed it BEFORE you drank the bucket of Veronese, so *there*. Just didn't want you to get a big head, so didn't mention it. L, I'm pretty sure I wanna be besties with Sarah now. She reviews things like me – kind of the "whaa?" method. LOL! I'm in a mood today, and that write up made me laugh so thank you. It sounds promising, albeit a bit pricey for an everyday serum. Haha, love this write up! Product sounds nice… My white-washed cheeks would actually welcome a bit of a pink glow I think.